Enjoy for breakfast, lunch, dinner or dessert. Hey, we don’t judge. In a bowl, combine the crackers with the sour cream, egg, harissa sauce, tomato paste, lime juice, parsley, and mustard. Add the crabmeat and stir to combine. Season with salt and pepper. With your hands, shape four patties. 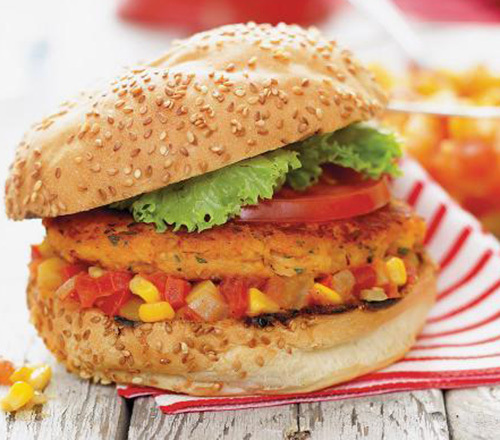 In a large skillet, brown the patties in the oil for 2 to 3 minutes on each side. Toast the buns. Generously spread homemade ketchup on the bottom buns and top with the patties. Add tomato slices and lettuce. Close with the top buns. In a large skillet, cook beef over medium heat until beef is no longer pink. Add garlic; cook 1 minute longer. Drain. 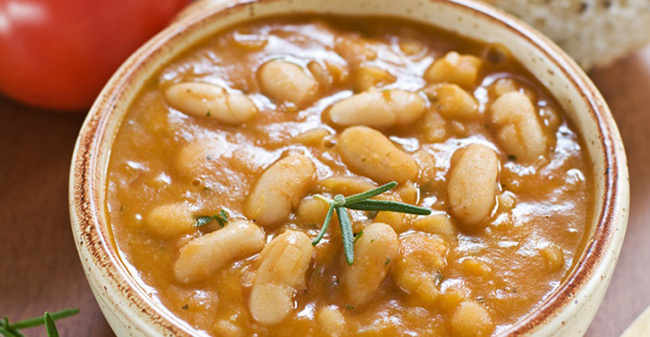 In a large bowl, combine the soup, 1 cup of picante sauce, cornstarch, parsley, paprika, salt and pepper. Fold in the beans, 1-1/2 cups of cheese, 1/2 cup onions and the beef mixture. On a lightly floured surface, roll dough to make two crusts to fit a 9-in. deep-dish pie plate. 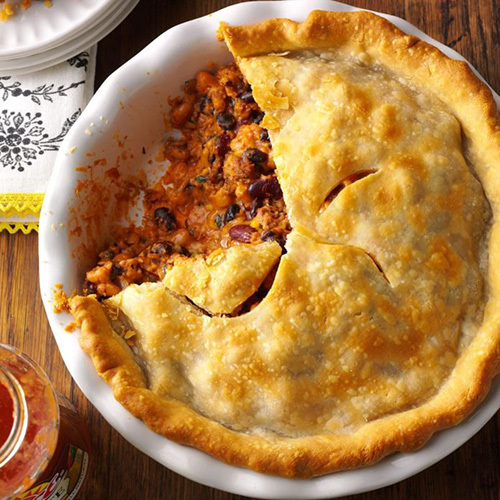 Line pie plate with bottom crust; fill with bean mixture. Top with remaining crust; seal and flute edges. Cut slits in top crust. Bake at 425° until lightly browned, 30-35 minutes. Let stand for 5 minutes before cutting. Garnish with the sour cream, olives and remaining picante sauce, cheese and onions. Freeze option: Cover and freeze unbaked pie. To use, remove from the freezer 30 minutes before baking. Cover edges of crust loosely with foil; place on a baking sheet. Bake at 425° for 30 minutes. Reduce heat to 350°; remove foil. Bake until golden brown, 55-60 minutes longer. Garnish as directed. 2. In a large, flat, oven-safe pan, heat the olive oil over medium heat. Add the onion and sauté until tender, 3 to 4 minutes. Add the garlic and cook until fragrant, 1 minute more. 3. Stir in the peppers and chorizo. Cook until the chorizo browns slightly, 5 to 6 minutes. 4. Stir the tomato paste into the pan and cook for 1 minute. Add the rice and stir well to combine. Cook for 1 minute more. 5. Pour in the wine and broth, then add the saffron, bay leaf and lemon juice. Stir well to combine and bring the mixture to a simmer. Nestle the shrimp and clams into the pan. 6. 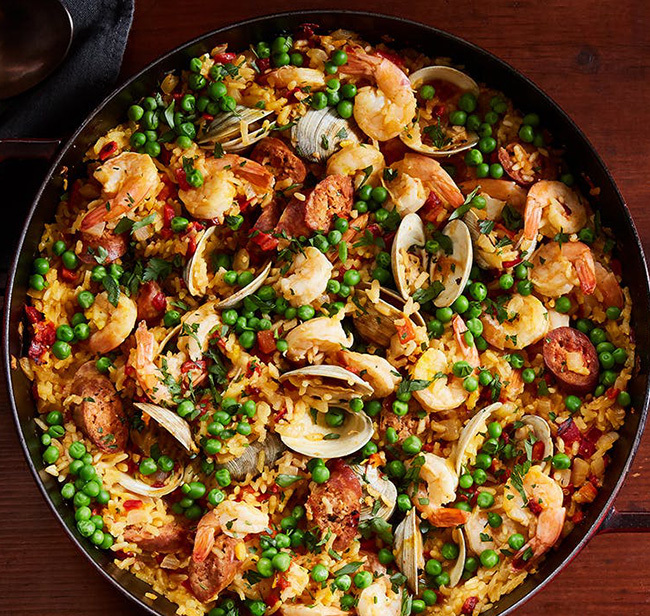 Bake the paella, uncovered, until the clams open, 22 to 25 minutes. Gently add the peas. Season with salt and pepper. Rim glasses with lemon wedge and dip in sugar. 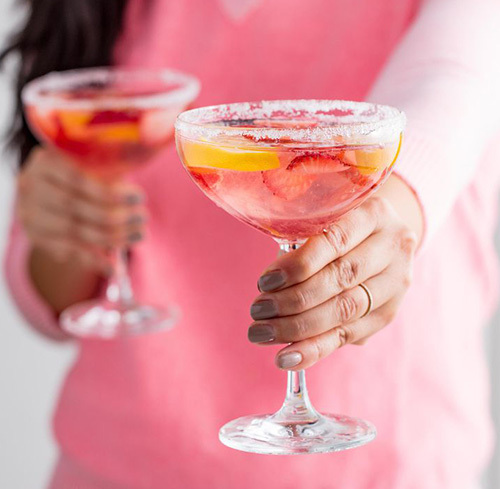 In a large pitcher, stir together moscato, pink lemonade, soda, vodka, and fruit. Add ice and stir to combine. Divide among glasses and serve. Cook the pasta according to the package directions until al dente. 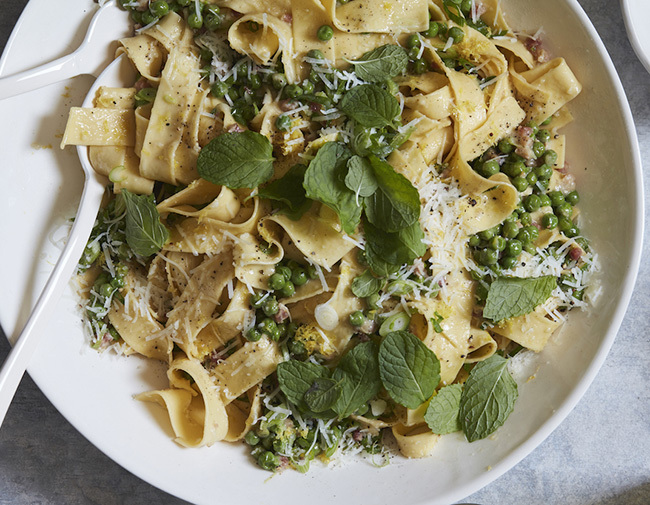 If using fresh peas, add the peas 2 minutes before the pasta is done. If using frozen, add 30 seconds before the pasta is done. Reserve 1 cup of the pasta cooking water before draining the pasta and the peas. In a large heavy bottom dutch oven skillet, add 2 tablespoons of olive oil over medium high heat. Add the pancetta and cook until browned, about 8-10 minutes. Season with pepper and turn off heat. 1. Place cauliflower florets in a mixing bowl, add 1 teaspoon cumin, 1/2 teaspoon coriander, a sprinkle of salt, and some cracked black pepper and toss together until cauliflower is well coated. 2. Place a large skillet over medium heat and add 1 1/2 tablespoons oil. 3. Add cauliflower and sauté for 3 to 4 minutes. 4. Using a slotted spoon, transfer cauliflower to a plate and set aside. 5. Add remaining oil to skillet. Add shallot and garlic and sauté 3 to 4 minutes. 6. Add remaining spices and continue to sauté for an additional 2 minutes. 7. Stir tomato puree into skillet and lightly season with salt and pepper. 8. Lower heat to medium-low and simmer for 5 minutes. 9. Add cauliflower back into skillet, along with chickpeas, season with salt and pepper and continue to simmer for 10 to 15 minutes or until cauliflower is tender. 10. 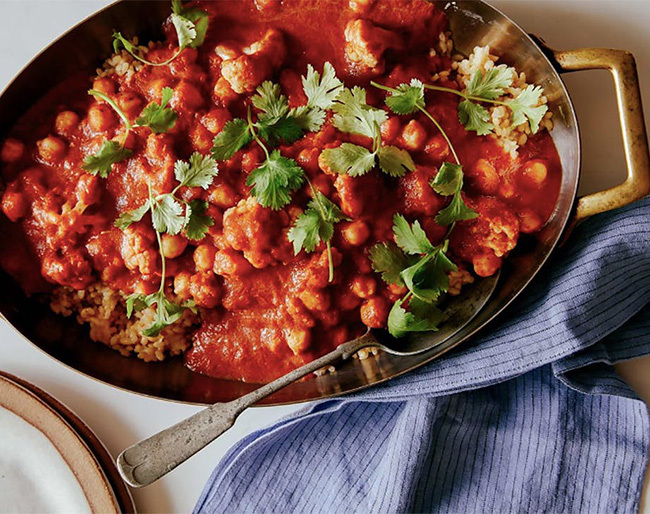 Stir coconut milk into cauliflower mixture and simmer for an additional 3 to 4 minutes or until sauce is thick (enough to thoroughly coat cauliflower and chick peas) and creamy. Adjust seasonings as needed. 11. Top with chopped cilantro and mint, if using. Serve over brown basmati rice, with a side of grilled pita bread. 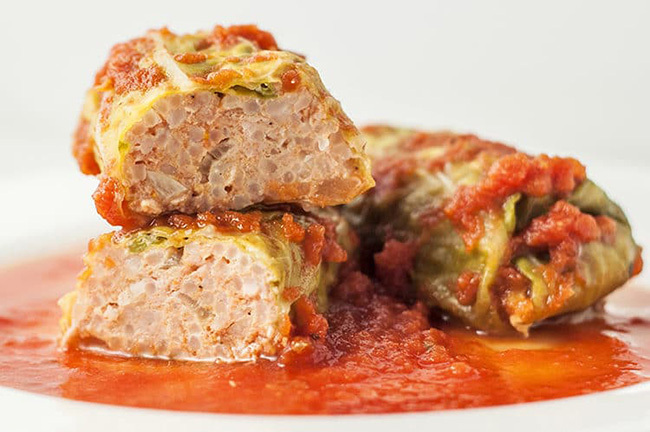 Scoop about 1/4 cup of the gound turkey mix into the center of each cabbage roll. Roll up the leaves, tucking in the ends. Top with tomato sauce and cover. 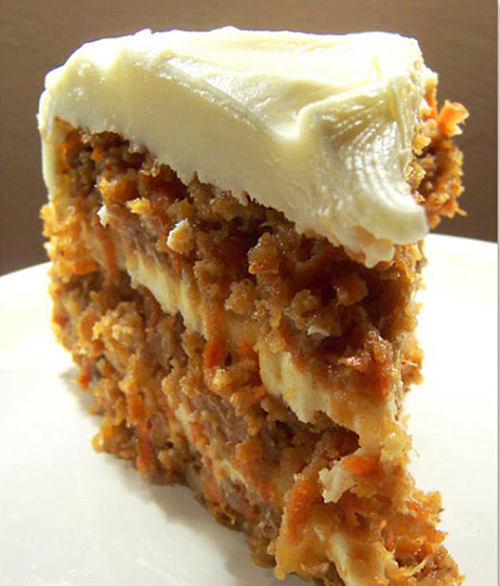 Beat cream cheese & sweetened condensed milk. Add in pudding mix, milk & vanilla and beat until completely mixed. In a separate bowl, beat heavy cream until soft peaks form. Add powdered sugar and continue beating until stiff peaks form. Set 2 1/2 cups aside. Fold remaining whipped cream into pudding mixture. 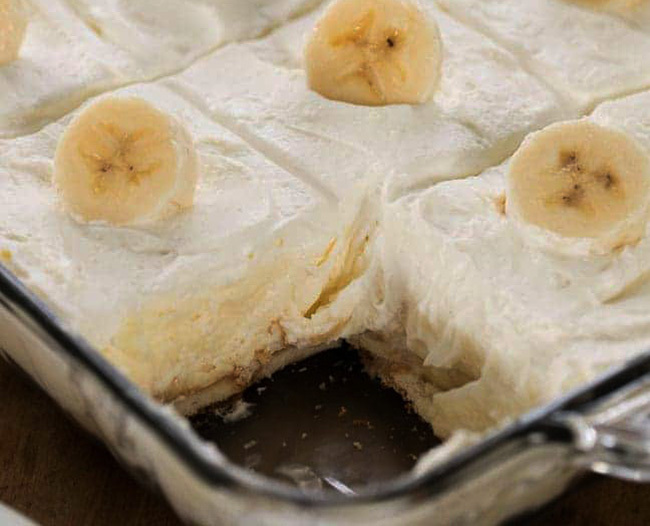 Line the bottom of a 9x13 pan with vanilla wafers, top with sliced bananas. Spread pudding mixture over top. Top with remaining whipped cream. Cover and refrigerate 4 hours or overnight. 1. Preheat the oven to 375°F. Grease two mini-muffin pans with nonstick cooking spray. 2. Bring a large pot of salted water to a boil. Add the elbow pasta and cook according to the package instructions, about 7 to 9 minutes. Drain. 3. In a large pot, melt the butter over medium heat. Add the onion and sauté until translucent, 4 to 5 minutes. Add the garlic and cook until fragrant, 1 minute more. 4. Sprinkle the flour into the pot and stir to combine. Cook for 2 minutes, stirring constantly. 5. Add the milk and whisk well to combine. Bring the mixture to a simmer over medium-low heat, stirring occasionally. 6. Season the sauce with the cayenne pepper (if using), salt and pepper. 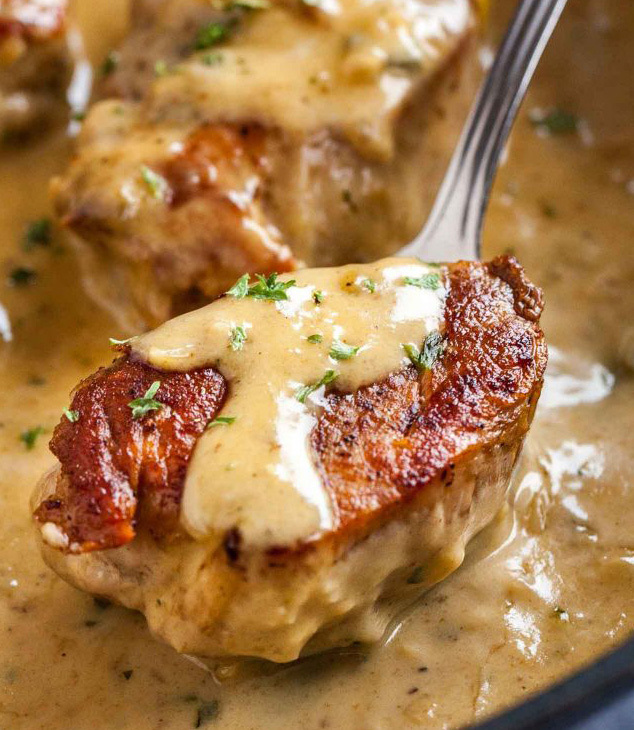 Remove the pot from the heat and stir in the white cheddar and 1½ cups of the yellow cheddar. Stir until the mixture is melted. 7. Stir in the cooked pasta and mix until it is evenly coated with the sauce. 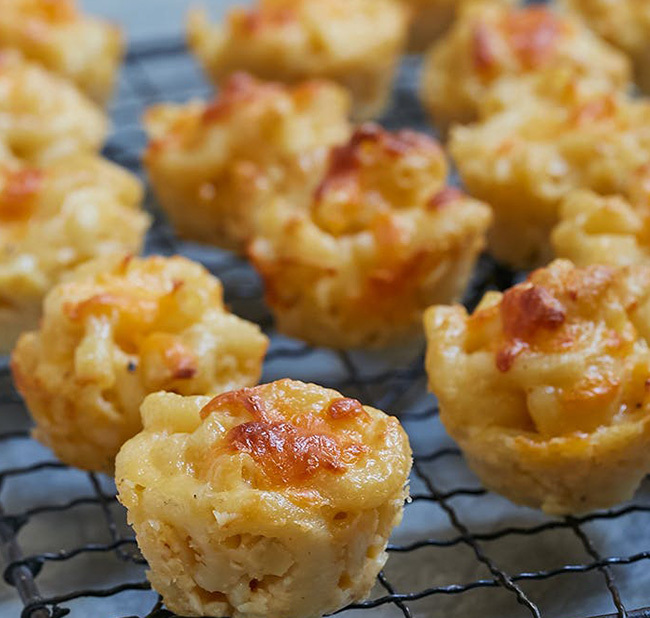 Scoop 1½ to 2 tablespoons of the mac-and-cheese mixture into each cavity of the prepared pans. 8. Sprinkle a few pieces of yellow cheddar on top of each mac-and-cheese bite and then transfer the pans to the oven. Bake until the cheese is melted and the bites become golden, 17 to 20 minutes. 9. Let the bites cool for 15 minutes before unmolding and serving. Serve hot or at room temperature. Store leftovers in an airtight container in the refrigerator for up to two days. 1. Preheat the oven to 300°F. Lightly grease a baking sheet with the softened butter. 2. In a medium bowl, whisk the eggs. Add the milk and season with salt and pepper. Stir in half of the dill, reserving the other half for garnish. 3. Pour the eggs into the prepared pan. Arrange the smoked salmon evenly over the surface of the eggs and then add dollops of cream cheese. 4. Transfer the pan to the oven and bake until the eggs are just set, 15 to 17 minutes. 5. Slice the eggs into 12 even pieces. Serve immediately, garnished with red onion, capers and the reserved dill. 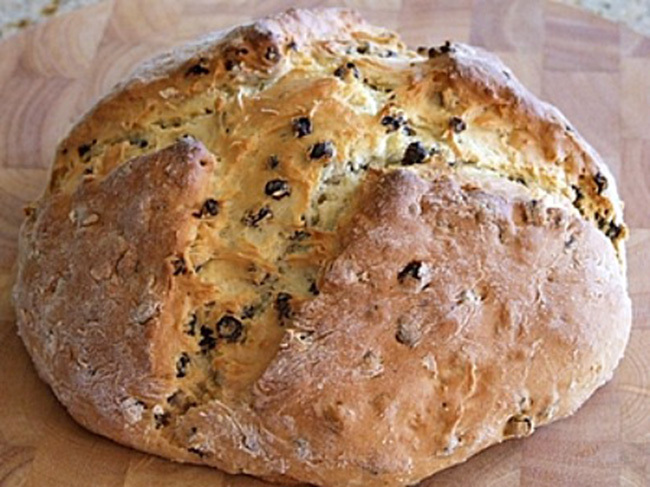 With St. Patrick’s Day weekend upon us you might want to try your hand at baking some delicious traditional Irish soda bread. We’ve included some prize-winning recipes here you might enjoy and with a traditional Irish stew to accompany this delicious bread. Bon appetit. Combine dry ingredients and mix well. Add buttermilk, stir with a wooden spoon. Turn dough out on to a lightly floured board and knead lightly until smooth, shape into a ball, place on a floured cookie sheet and with the back of your fingers press down to flatten. Cut a cross to divide the dough. Bake at 350º F for 50 minutes. Place on a wire rack to cool. Note: Either the brown or white bread is delicious with Irish stew, cut fairly thin and serve. 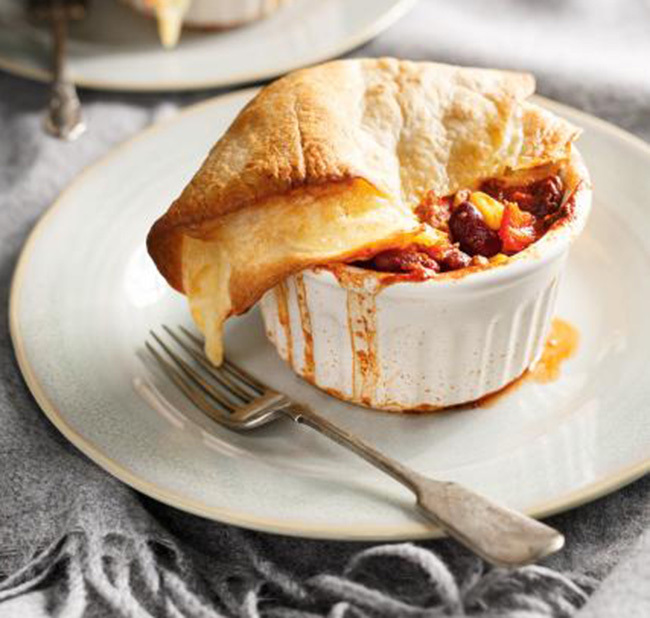 Place all ingredients in a large covered pot on the stove at a low heat, and cook slowly for about 1 ½ to 2 hours. If not thick enough mix a tablespoon of cornstarch and add just at the end and stir frequently. Trim the tenderloin of the silverskin and any excess fat. Cut the tenderloin into eight 2-inch-thick medallions. Flip each medallion onto a cut side and press down with the palm of your hand to flatten slightly. Season with salt and black pepper. Heat the olive oil and 1 Tbsp butter in a large sauté pan over high heat. When the butter is melted and foaming, add half of the meat and sear until nicely browned, 2 to 3 min. Flip and cook the other side until the meat is well browned and slightly firm to the touch, about another 2 min. Transfer to a plate and repeat with the remaining pork. Melt the remaining tablespoon butter in the pan. Add the shallots and a pinch of salt and sauté for about 30 seconds, using a wooden spoon to scrape up any browned bits from the bottom of the pan. Deglaze the pan with the white wine. Once the wine has almost completely evaporated add the cream and blue cheese cubes. Simmer over medium heat for about 3 minutes until sauce is smooth and thick. Return the pork and any accumulated juices to the pan, and cook, flipping the pork once, until it’s firm to the touch and still a little pink in the middle (cut into a piece to check), 2 to 4 min. Season to taste with salt and pepper and serve garnished with parsley. Cook the bacon in a Dutch oven, in a drizzle of olive oil, then remove with a slotted spoon, drain it on a paper towel, and set aside. Reserve 1 tablespoon of the bacon fat. Add olive oil and butter into the pot along with the bacon fat, allow them to melt together. Add in the diced onion, carrots and celery, and allow them to soften and saute for about 5 minutes. Add in the garlic, and once it becomes aromatic, add in about 2/3 of the reserved, crisped bacon, as well as the Italian seasoning, the sea salt and the pepper, along with the white beans, and stir to combine. Add in the hot chicken stock, stir, and allow the stew to gently simmer for about 40-45 minutes, partially covered. Half way through the cooking process, mash the beans a little bit with the back of your spoon, to break them up and release their natural starch to thicken the stew. After about 40 minutes, turn the heat off and finish the stew by adding in the chopped parsley, the lemon zest and the lemon juice. Beat 1 cup of creamcheese (room temp) with 1 tsp of vanilla escence and 1/2 cup of icing sugar. Beat and mix until smooth. Apply on the cooked cake and serve. Preheat the oven to 425 degrees Fahrenheit and line a large, rimmed baking sheet with parchment paper for easy clean-up. Cut off one-third of each pepper lengthwise (see photos). Use a small spoon (a serrated grapefruit spoon works great) to scoop out the seeds and membranes from each pepper, and discard those pieces. 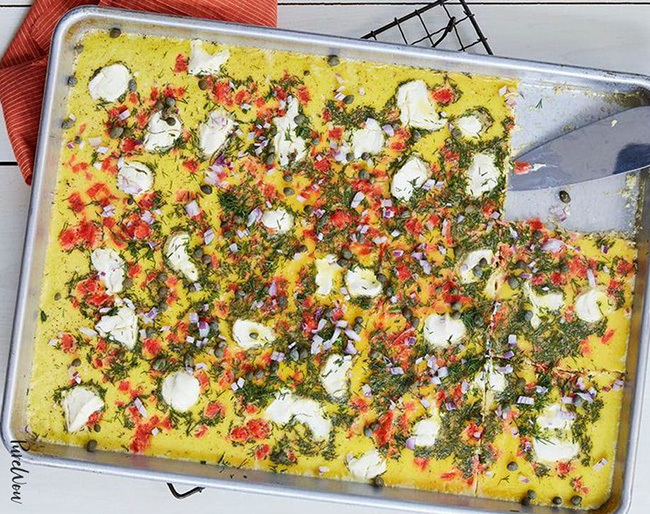 In a bowl, combine the cream cheese, ¼ cup chopped cilantro and green onion, garlic powder, onion powder and salt. Stir to combine. Stuff the peppers with the cream cheese mixture (you might have a small amount left over). Top each of the peppers with a small mound of cheese lengthwise. Bake for 10 to 13 minutes, until the cheese is bubbling and starting to turn golden. Meanwhile, place a big handful of chips in a food processor and process until the chips are broken into tiny pieces (or, you can crush them under a rolling pin). Stir the feta, if using, and the remaining 1 tablespoon of cilantro and green onion into the chips. 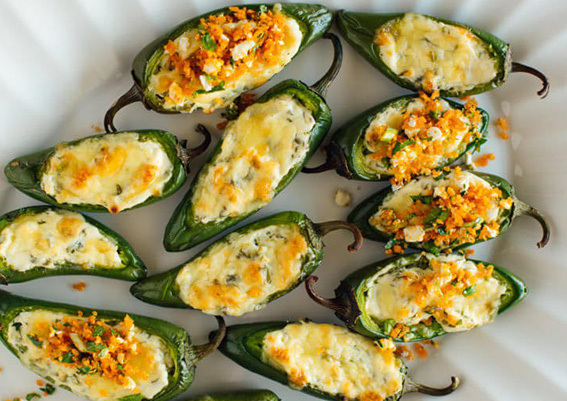 Transfer the jalapeño poppers to a large serving dish and top each pepper with the crushed chip mixture. Serve! With the rack in the middle position, preheat the oven to 400°F (200°C). In a large pot over high heat, soften the bell peppers and onion in the oil. Add the meat and cook until it begins to brown. As it cooks, break it up with a wooden spoon. Add the spices and cook for 1 minute, stirring constantly. Add the remaining ingredients and continue cooking for 15 minutes or until the chili has thickened. Season with salt and pepper. Spoon into six 1 1/2-cup (375 ml) ramekins and place on a baking sheet. Set aside. In a shallow dish, whisk together the milk and oil. Quickly dip the tortillas in the milk mixture. Place the cheese on the tortillas and fold to seal. Place 1 folded tortilla onto each ramekin. Bake for 15 minutes or until the tortillas are golden brown. Place the chicken, water, bouillon, peppercorns and cloves in a stockpot. Cover and bring to a boil; skim foam. Reduce heat; cover and simmer 45-60 minutes or until chicken is tender. Strain broth; return to stockpot. Remove chicken and set aside until cool enough to handle. Remove meat from bones; discard bones and skin and cut chicken into chunks. 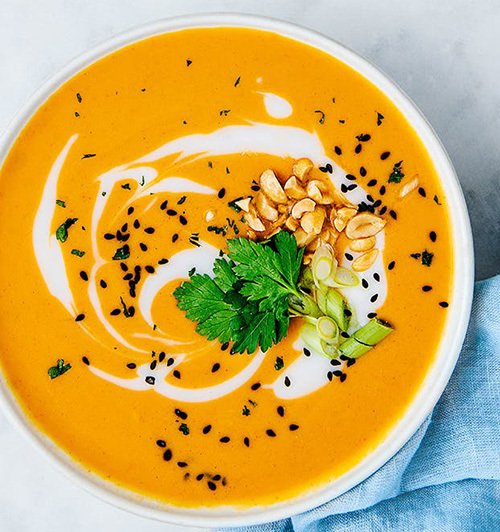 Cool broth and skim off fat. 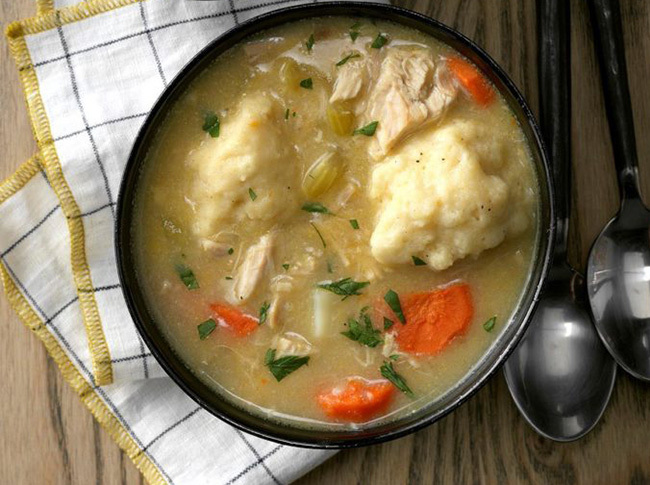 Return chicken to stockpot with soups, vegetables and seasonings; bring to a boil. Reduce heat; cover and simmer for 1 hour. Uncover; increase heat to a gentle boil. Discard bay leaf. For dumplings, combine dry ingredients in a medium bowl. Stir in egg, butter and enough milk to make a moist stiff batter. Drop by teaspoonfuls into soup. Cover and cook without lifting the lid for 18-20 minutes. Sprinkle with parsley if desired. Run a veggie peeler down the length of the zucchini creating thin strips of zucchini. Continue until you reach the core where the seeds are. Discard the core or save it for another use (I toss mine in soup). Turn the stove onto medium high and place the zucchini strips in a non-stick pan with the chicken broth or water. Cook for about 3 minutes or just until heated through. Move the zucchini strips over to one side of the pan and add the cream cheese & garlic powder to the empty side. Turn the heat down to low and stir the cream cheese just till melted. Toss the cream cheese, parmesan cheese & zucchini until well mixed and heated through. Serve immediately. Cut the ends of the zucchini and spiralize using the medium noodle blade (not the smallest noodle). Preheat olive oil over medium high heat. Add zucchini noodles and garlic powder (no salt). Cook 3-5 minutes, stirring tongs until slightly softened/wilted. Move noodles to one side and add cream cheese, stirring until melted. Toss with zoodles and season with salt and pepper to taste. Stir in grated parmesan cheese. Garnish and serve. Do not add salt to the zoodles before or during cooking. Peanut Butter Cornflake Cookies are an easy and sweet treat with no baking required! Everyone will love these chewy, sweet, and salty cookies that are ready in no time at all! In a large saucepan, combine the sugar, corn syrup, and peanut butter. Cook over medium high heat until center starts to boil, make sure to stir constantly so the sugar doesn’t burn. 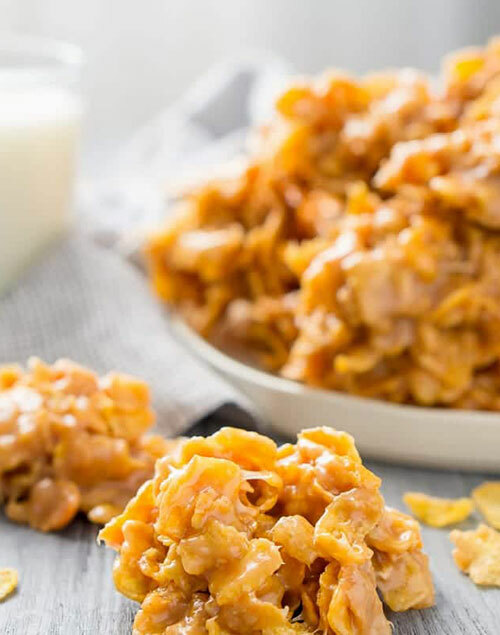 As soon as the sugar mixture comes to a boil, remove from heat and stir in the vanilla extract and corn flakes, mix until corn flakes are evenly coated in sugar mixture. Use an ice cream scoop to drop cookies onto wax paper as quickly as possible before mixture starts to cool and harden. Scald Milk. Stir in butter, 6 tbsp sugar and salt. Cool to lukewarm. Dissolve remaining 1 tsp sugar in warm water. Sprinkle yeast over water mixture. Let stand in a warm place for 10 minutes. Stir. In a large mixing bowl, combine lukewarm milk mixture with eggs. Stir in dissolved yeast mixture. Add four to five cups of the flour and beat well for 10 minutes. With a wooden spoon, gradually add enough of the remaining flour to make a soft dough. Turn out on to a lightly floured surface and knead until smooth and elastic, adding additional flour as needed. This is a soft dough! Place dough in a well-greased bowl and roll around to grease all sides of the dough. Cover with a damp cloth and let rise in a warm place until dough doubles in size, about one hour. Punch down dough and turn out onto a lightly floured surface. Divide dough in half. To fill, roll out each piece of dough into a 9 x 18-inch rectangle. Spread 1/4 cup of melted butter evenly onto each rectangle. Combine sugar and cinnamon for filling. Sprinkle onto the rectangles. Roll dough up like a jelly roll, starting from the long side. Cut into 2-inch slices. Place remaining ¼ cup of melted butter into the bottom of a 16½ x 11½ x 2½-inch pan. Arrange slices in the pan and cover loosely with greased wax paper. Let rise in pan until doubled in size, about 45-60 minutes. Remove from oven and immediately invert onto a serving tray. 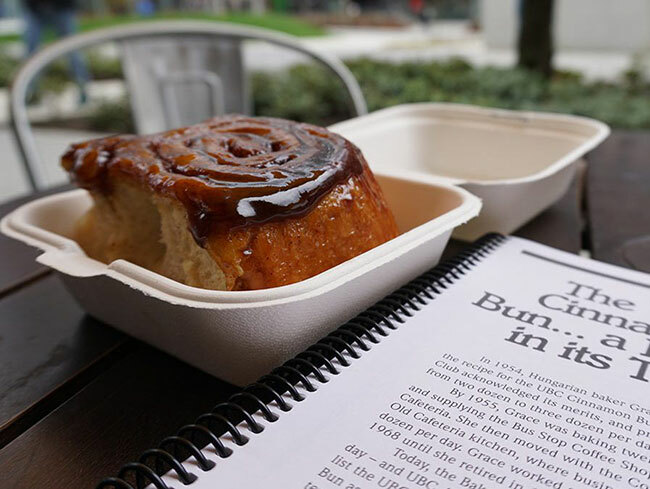 Nearly 65 years of UBC Alumni remember the pillowy softness and caramelized edges of the UBC Cinnamon Bun as a quintessential part of the UBC experience. But where did it all begin? The UBC Cinnamon Bun recipe was first perfected by Hungarian Baker Grace Hasz in 1954. Within a few years she went from baking two dozen to a staggering 120 dozen per day as the bun grew in popularity. Grace baked cinnamon buns for UBC until her retirement in 1971. She baked by instinct and never wrote the recipe down, though her grandson has recorded his attempts to recreate the original recipe from memory. 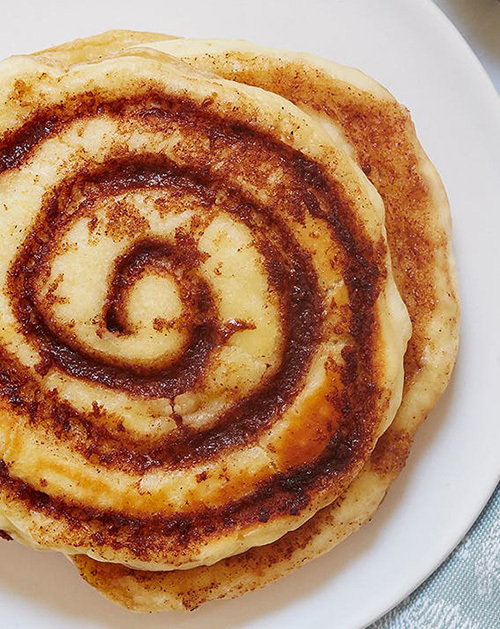 A few things have changed since 1955 – the original recipe used margarine, a holdover from war-time butter shortages, and was said to have so much cinnamon the filling looked black – but the association between UBC and great cinnamon buns has never diminished. Today’s recipe is still made from scratch every day, using real butter and simple ingredients. Next time you’re craving a cinnamon bun, you’ll find them in most UBC Food Services locations. 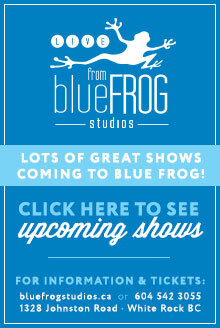 But go early – they often sell out!